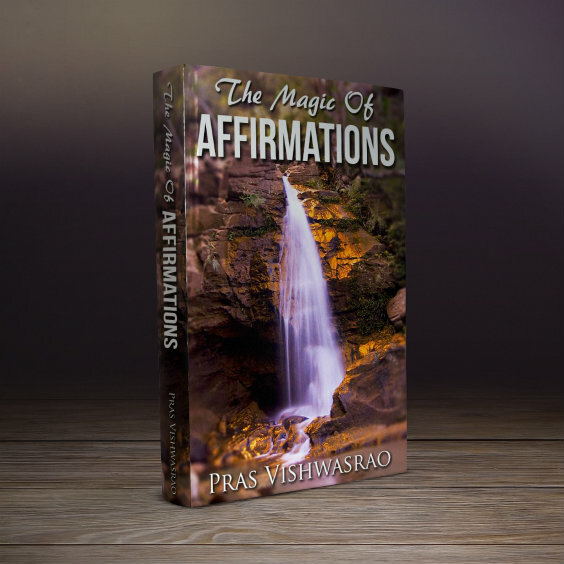 Happiness is a journey, not a destination and happiness affirmations are your companion in this wonderful journey. These affirmations will help you in your quest for happiness. According to Samuel Taylor Coleridge, “The happiness of life is made up of minute fractions, the little, soon-forgotten charities of a kiss, a smile, a kind look, a heartfelt compliment in the disguise of a playful raillery, and the countless other infinitesimals of pleasant thought and feeling”. Happiness is determined by our attitude toward life. Two different people can have different feelings in the same situation, depending on their perspective. For example, after completing a particularly difficult task, one person may feel relieved that ‘work’ has been completed. Another person may be happy that he has completed his task satisfactorily. One is relieved, one is happy! Not everyone is born with a happy disposition. But psychologists say that we can be trained to be happy. What is required is a small change in thinking. Happiness affirmations will help you change your thinking. That is why Abe Lincoln said "People are just as happy as they make up their minds to be." Experts say that there are certain things that we can do on a regular basis to bring happiness into our lives. Performing a random act of kindness is one. Expressing your gratitude to someone who has affected or is affecting your life in a positive way is another. Visualizing a good future for yourself on a regular basis is yet another way. As the saying goes, “He is truly happy who makes others happy”. Choose any happiness affirmation that suits you and use it wisely. Just as one has to work on one’s body to make it fit, one has to work on happiness to make it happen. If you say “I am going to be happy when ………., then it's never going to happen because when you have achieved your goal, another one is ready. It becomes a never ending process. That is why eastern sages have said “Enjoy the process. The fruit will take care of itself”. 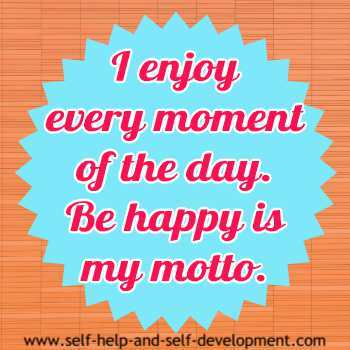 The positive affirmations for happiness given below will help you enjoy the process. Repeating these affirmations may or may not make you happy. But they will definitely change your perspective on happiness. Repeat them often and regularly do the tasks given above and happiness may not be as elusive as it seems to be. is full of joy and ends with contentment. I touch many lives. 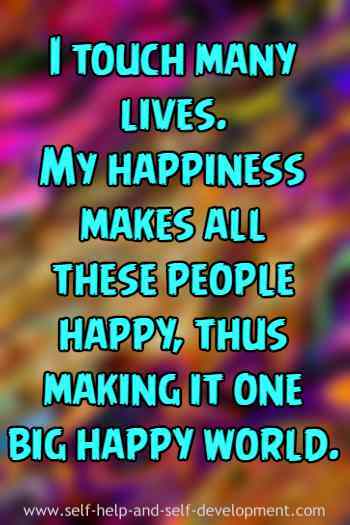 My happiness makes all these people happy, thus making it one big happy world. 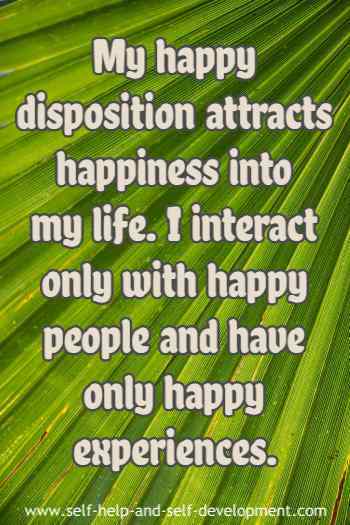 My happy disposition attracts happiness into my life. I interact only with happy people and have only happy experiences. I am grateful to God for this wonderful life. I am thankful to every body who has touched my life and made it worth living. I enjoy every moment of the day. Be happy is my motto. Being happy comes easy to me. 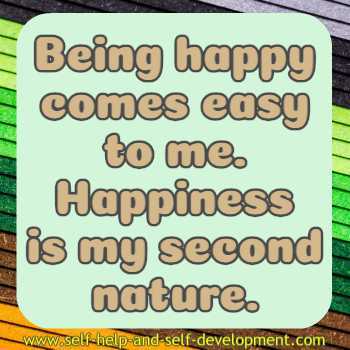 Happiness is my second nature. 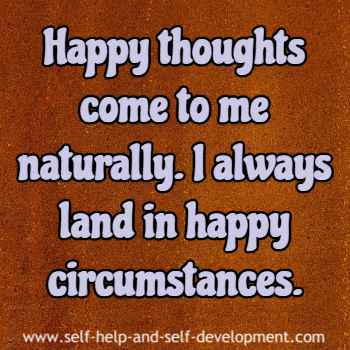 Happy thoughts come to me naturally. I always land in happy circumstances. 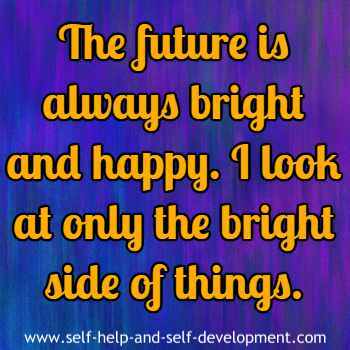 The future is always bright and happy. I look at only the bright side of things. I perform my random act of kindness regularly. Kindness breeds love and love results in happiness. For me, happiness is a journey, not a destination. God has blessed me with happiness and my journey is endless.